(vi) 7003160000000000000♠0.16 (0.40) 2006 Aapravasi Ghat was the first site chosen by the British government to take part in the "Great Experiment", where indentured laborers were used instead of slaves. Between 1834 and 1920, almost half a million contracted workers passed through پورٹ لوئس from India, either to work in Mauritius or to transfer to other British colonies. (vii), (ix), (x) 7010773600000000000♠7,736,000 (19,120,000) 1991 Africa's largest protected area, located in the Saharan desert of Ténéré, consists of the volcanic rock mass of Aïr and a small isolated ساحلian pocket with unique flora and fauna. The natural reserve was placed on UNESCO's List of World Heritage in Danger in 1992, due to the increase in military conflicts and the hostage-taking of six reserve staff in February. Removal from this list was considered in 1999, but as of 2011, its position remains unchanged. (ii), (iii), (vi) — 1979 Founded in the 9th century BCE, Carthage was developed into a trading empire spanning the بحیرہ روم, and was, according to UNESCO, "home to a brilliant civilization." The city was destroyed in 146 BCE in the Punic Wars at the hands of the Romans, but was later rebuilt by these. (ii), (iii), (vi) — 1982 The formerly Greek colony was Romanized and transformed into a capital, until it was destroyed by an earthquake in 365. The thousand-year-old ruins have remained renowned since the 18th century. (ii), (iii), (iv), (vi) 7005420000000000000♠42 (100) 1997 The important Roman outpost of Volubilis was founded in the 3rd century BCE to become the capital of موریتانیہ. It contained many buildings, the remains of which have survived extensively to this day. (ii), (iii), (iv), (v) 7007235700000000000♠2,357 (5,820) 2011 The site was the centre of the مملکت کوش, a major force active from the 8th century BCE to the 4th century CE. It is home to pyramids, temples, and domestic buildings, among other vestiges. (v) — 1980 The site, north-east of کوماسی, hosts the final intact remains of the سلطنت اشانتی, which peaked in the 18th century. The dwellings, which are made of earth, wood, and straw, are susceptible to the damages caused by the "onslaught of time and weather." (iii), (vi) 7008126400000000000♠12,640 (31,200) 2006 The 127-site area contains the richest concentration of rock art in Central Africa, ranging from پتھر کا دور paintings to contemporary work from farmers. The symbols depicted in the rock art are strongly centred around women, and retain a cultural significance for the Chewa. (iii), (iv) 7005300000000000000♠30 (74) 1982 The ruins of a Roman town in a mountainous location, including a forum, temples, basilicas, triumphal arches and houses, each adapted to a location 900 میٹر (3,000 فٹ) above sea level. (vii), (x) 7008160000000000000♠16,000 (40,000) 1981 The Senegal River delta wetland area consists of streams, lakes, ponds and backwaters. It is the home to 1.5 million birds, including the great white pelican, the purple heron, the African spoonbill, the great egret, and cormorants. The sanctuary also features crocodiles, African manatees, and other typical ساحلian species. (ii), (iii) 7005700000000000000♠70 (170) 1997 The site features the ruins of Dougga, a former capital of a لیبیاn–Punic state, which flourished under Ancient Rome and the بازنطینی سلطنت, but declined in the اسلامی عہدِ زریں. (ii), (iii) — 1979 The fortress was the residence of the Ethiopian emperors during the 16th and 17th century. The city remains, which feature buildings with Hindu and مسلم فن تعمیر influences, were later remodelled with Baroque-style architecture by Jesuit missionaries. (i), (iv) 7009161485000000000♠161,485 (399,040) 2011 Fort Jesus is a پرتگال fort built from 1593 to 1596 on Mombasa Island to guard the old port of Mombasa, Kenya. The site's layout follows the نشاۃ ثانیہ ideal that the human body is perfectly proportionate. (vii), (ix) 7007398400000000000♠3,984 (9,840) 1986 Most of the park, in the middle of the island of La Gomera of the جزائر کناری, is covered with a lush laurel forest. (iii), (iv), (vi) 7006183000000000000♠183 (450) 2003 The five sites in the دریائے نیل feature temples that are testimonial to the Napatan and Meroitic cultures. (vii), (ix), (x) 7009239566000000000♠239,566 (591,980) 1999 The park features a variety of landforms, including مرجانی جل پتھرs, long sandy beaches, coastal dunes, lake systems, and papyrus wetland, caused by fluvial, marine and aeolian processes. (iii), (v), (vi) — 1988 The former capital was founded in 670 and flourished in the 9th century. Its heritage includes the جامع القیروان الاکبر and the Mosque of the Three Gates. (ii), (v) 7005600000000000000♠60 (150) 1992 A unique Islamic city on the بحیرہ روم coast, the former site overlooks the قرطاج trading posts of the 4th century BCE. It contains remains of a citadel, old mosques, and Ottoman-style palaces. (vii) 7008755750000000000♠75,575 (186,750) 1987 The volcanic massif کلیمنجارو is Africa's highest point at 5,895 میٹر (19,341 فٹ), and is surrounded by a park with savanna and forest featuring numerous mammals. (iii), (v) 7008140000000000000♠14,000 (35,000) 2011 The site features 55 کلومیٹر (180,000 فٹ) of stonewalled terraces and fortified settlements in the Konso highlands of Ethiopia. (iii), (vi) 7004800000000000000♠8 (20) 2003 The site is a testimony to the encounters between Africa and Europe from pre-colonial times to independence along the دریائے گمبیا. (vii), (ix), (x) 7007940000000000000♠9,400 (23,000) 1984 جھیل ملاوی contains hundreds of fish species, mostly endemic. (viii), (x) 7009161485000000000♠161,485 (399,040) 1997 Turkana, as Africa's largest saline lake, is an important area for the study of fauna and flora. It is a breeding ground for the Nile crocodile, دریائی گھوڑا and several venomous snakes. (iii), (iv) — 1980 The prehistoric site near جھیل ٹرکانا is the location of many fossil findings, such as Homo gracilis. (ii), (iii), (v) 7007400000000000000♠4,000 (9,900) 1982 The intact, traditional human habitat was built around five ksour in the 10th century by the اباضیہes. (ix), (x) 7010174000000000000♠1,740,000 (4,300,000) 1988 The park features vast savannas with a wealth of flora and fauna, such as black rhinoceros, ہاتھیs, چیتاs, تیندواs, wild dogs, red-fronted gazelles and buffalo. The site was placed on the List of World Heritage in Danger in 1997 due to grazing and poaching that is thought to have claimed 80% of the wildlife in the park. Also cited was the shooting of four park staff and "a general state of deteriorating security". (iv), (v) 7008281680000000000♠28,168 (69,600) 2003 The open savanna landscape lies at the confluence of the دریائے لیمپوپو and Shashe Rivers. It was the heart of the Mapungubwe Kingdom until the 14th century, when the area was abandoned, leaving untouched remains of palaces and settlements. (iv), (v) 7007110700000000000♠1,107 (2,740) 1985 The town was founded in the 1070s and remained a political, economic, and cultural centre for a long time. Monuments from that period include the Koutoubia Mosque, the قصبہ، الجزائر, and the battlements. The city also holds newer features, including palaces. (ii), (iv), (v) 7004700000000000000♠7 (17) 1997 Morocco's most complete medina served as the main point of contact between Morocco and اندلوسیا during the 8th century. The town was rebuilt by Andalusian refugees following the استرداد. (i), (iii), (vi) 7008163580000000000♠16,358 (40,420) 1979 The former capital features funerary monuments, like rock tombs, mastabas, temples, and pyramids. It is one of the قدیم دنیا کے سات عجائبات عالم. (vii), (viii) 7007878000000000000♠8,780 (21,700) 1989 The falls of the Zambezi River, which is more than 2 کلومیٹر (6,561 فٹ 8 انچ) wide, plunge down various basalt gorges resulting in a colorful mist. (vii), (ix) 7009142020000000000♠142,020 (350,900) 1997 The park surrounds the 5,199 میٹر (17,057 فٹ) کوہ کینیا and features twelve glaciers. (x) 7009913000000000000♠913,000 (2,260,000) 1981 The forests and savannas bordering the دریائے گمبیا have a diverse fauna, including Derby eland, chimpanzees, lions, birds, reptiles, and amphibians. The park was listed as being endangered for low mammal populations, the construction of a dam, and management problems. (i), (iii), (vi) 7006374000000000000♠374 (920) 1979 Located along the دریائے نیل, the site contains monuments such as the Temple of رمسيس ثانی and the Sanctuary of ایزیس. (x) 7010137262500000000♠1,372,625 (3,391,830) 1996 Covering a fifth of the Ituri Rainforest in the دریائے کانگو basin, the reserve contains many threatened species of primates and birds. It is inhabited by the nomadic pygmy Mbuti and Efé tribes. In 1997, looting, the killing of elephants, and the departure of reserve staff led the World Heritage Committee to place the reserve on its List of World Heritage in Danger, only a year following its inscription as a natural heritage site. (ii), (iv) 7004800000000000000♠8 (20) 2004 The fortification, akin to نشاۃ ثانیہ military design from the early 16th century, was taken over by Morocco in 1769. Surviving buildings include the cistern and a Gothic church. (iii) — 1985 The city was abandoned in 250 BCE during the First Punic War, and is the only surviving example of a فونیقی–Punic settlement. (iii) 0 ﻿— 1985 Thousands of cave paintings are visible in different styles, dating from 12,000 BCE to 100 CE. (i), (ii), (iii) 0 ﻿— 1978 The site contains eleven medieval cave churches from the 13th century. (iii), (iv) 7005480000000000000♠48 (120) 1985 The city held the seat of twelve kings who ruled the داهومی between 1625 and 1900. All but one king built their palace within the area. (iii) 0 ﻿— 1981 The site features the remains of two ports used extensively for trade across the Indian Ocean from the 13th and 16th century. It was placed onto the list of List of World Heritage in Danger by the World Heritage Committee in 2004, citing "the continuing deterioration and the serious threats affecting the property of the Ruins of Kilwa Kisiwani and Songo Mnara". Conditions subsequently improved and the site was removed from the World Heritage in Danger list in 2014. (iii), (v), (vi) 7007153800000000000♠1,538 (3,800) 2008 The site comprises eleven forests spread 200 کلومیٹر (660,000 فٹ) along the coast of Kenya. They hold the remains of villages built during the 16th century by the Mijikenda, and are now considered sacred sites. (iv), (vi) 7008601000000000000♠60,100 (149,000) 2002 The orthodox monastery from the 6th century is positioned near Mount Horeb where, according to the عہد نامہ قدیم, موسیٰ علیہ السلام received the Tablets of the Law. The region is sacred for Christians, Muslims and Jews. (vii), (ix) 7010360000000000000♠3,600,000 (8,900,000) 1984 Africa's largest tropical rain forest reserve is situated at the heart of the دریائے کانگو basin and only accessible by water. It is the habitat of endangered species such as the bonobo, the Congo peafowl, the forest elephant, and the slender-snouted crocodile. The site was deemed to be in danger in 1999, due to increased poaching activities and encroachments. (vii), (x) 7010147630000000000♠1,476,300 (3,648,000) 1981 The vast savanna is known for the annual migration for herds of wildebeest, غزال, zebras, and their predators. (vii), (x) 7008220000000000000♠22,000 (54,000) 1978 The eroded Ethiopian plateau comprises jagged mountain peaks, deep valleys, and sharp precipices dropping about 1,500 میٹر (4,900 فٹ). The decrease of the walia ibex, bushbuck, and bushpig populations, as well as an increase of the human population in the park prompted the World Heritage Committee to place it on their List of World Heritage in Danger in 1996. (i), (iii) 7005100000000000000♠10 (25) 2006 The groups of stone circles are among over 1,000 different monuments along the دریائے گمبیا. Used as burial grounds, they were erected between the 3rd century BCE and the 16th century CE. (iii), (v), (vi) 0 ﻿— 1999 The site features the Palace of the Hidi, terraced fields, and the remains of a former iron industry. (vii), (viii) 7008189900000000000♠18,990 (46,900) 2007 The national park features the ٹیڈ stratovolcano, which at 3,718 میٹر (12,198 فٹ) is Spain's tallest mountain and the world's third-tallest volcano. (ii), (iv), (v) 0 ﻿— 1988 The city was a centre for the propagation of Islam in the 15th and 16th centuries, and features three mosques and many madrasahs. The sites were deemed endangered after the Battle of Gao in June 2012, which followed several weeks of constant threats to the area. Days later, some sites within Timbuktu were destroyed by Ansar Dine, an Islamist group, citing religious reasons. (ii), (iii), (iv) 7002400000000000000♠0.04 (0.099) 1982 A military colony built by تراجان in 100 CE, the site features cardo and decumanus streets, typical of a Roman town. (iii), (iv) 7005520000000000000♠52 (130) 1982 First a قرطاج trading center, Tipasa was converted into a military base by the Romans. Heavy Christian influences can be seen from the 3rd and 4th centuries, though Tipasa went into steady decline in the بازنطینی سلطنت period. (i), (iv) 0 ﻿— 1980 The archaeological site contains 36 monuments, which includes 32 carved stelae covered with symbols hard to decrypt. (vii), (x) 7009152000000000000♠152,000 (380,000) 1990 The canyon of the Manambolo River comprises karstic and limestone landscapes cut into peaks and a forest of limestone needles. It also holds undisturbed forests, lakes and چمرنگs, which are the habitat for lemurs and birds. (i), (iii), (vi) 7007480000000000000♠4,800 (12,000) 2001 The site features more than 4,500 rock art paintings in the صحرائے کالاہاری. Archaeological records provide evidence of human and environmental activities ranging over 100,000 years. (viii) 7008300000000000000♠30,000 (74,000) 2005 The crater, with a diameter of 190 کلومیٹر (620,000 فٹ), is the largest, oldest, and most deeply eroded astrobleme found on Earth, dating back more than two billion years. (ix), (x) 7009220000000000000♠220,000 (540,000) 1996 The park is in the zone between savanna and forest lands, and is an important ecosystem for the biogeographical area. ↑ "Aapravasi Ghat". یونیسکو. http://whc.unesco.org/en/list/1227. Retrieved on 28 May 2010. ↑ "Abu Mena". یونیسکو. http://whc.unesco.org/en/list/90. Retrieved on 28 May 2010. ↑ "Abu Mena – Threats to the Site (2001)". یونیسکو. http://whc.unesco.org/en/list/90/threats/. Retrieved on 27 August 2010. ↑ "Air and Ténéré Natural Reserves". یونیسکو. http://whc.unesco.org/en/list/573. Retrieved on 28 May 2010. ↑ "Air and Ténéré Natural Reserves – Threats to the Site (1992)". یونیسکو. http://whc.unesco.org/en/list/573/threats/. Retrieved on 28 August 2010. ↑ "Decision 33COM 7A.10 – Air and Ténéré Natural Reserves (Niger) (N 573)". یونیسکو. http://whc.unesco.org/en/decisions/1770. Retrieved on 28 August 2010. ↑ "Aksum". یونیسکو. http://whc.unesco.org/en/list/15. Retrieved on 28 May 2010. ↑ "Al Qal'a of Beni Hammad". یونیسکو. http://whc.unesco.org/en/list/102. Retrieved on 28 May 2010. ↑ "Aldabra Atoll". یونیسکو. http://whc.unesco.org/en/list/185. Retrieved on 28 May 2010. ↑ "Amphitheatre of El Jem". یونیسکو. http://whc.unesco.org/en/list/38. Retrieved on 28 May 2010. ↑ "Ancient Ksour of Ouadane, Chinguetti, Tichitt and Oualata". یونیسکو. http://whc.unesco.org/en/list/750. Retrieved on 28 May 2010. ↑ "Ancient Thebes with its Necropolis". یونیسکو. http://whc.unesco.org/en/list/87. Retrieved on 28 May 2010. ↑ "Archaeological Site of Carthage". یونیسکو. http://whc.unesco.org/en/list/37. Retrieved on 28 May 2010. ↑ "Archaeological Site of Cyrene". یونیسکو. http://whc.unesco.org/en/list/190. Retrieved on 28 May 2010. ↑ "Archaeological Site of Leptis Magna". یونیسکو. http://whc.unesco.org/en/list/183. Retrieved on 28 May 2010. ↑ "Archaeological Site of Sabratha". یونیسکو. http://whc.unesco.org/en/list/184. Retrieved on 28 May 2010. ↑ "Archaeological Site of Volubilis". یونیسکو. http://whc.unesco.org/en/list/836. Retrieved on 28 May 2010. ↑ "Archaeological Sites of the Island of Meroe". یونیسکو. http://whc.unesco.org/en/list/1336. Retrieved on 17 August 2011. ↑ "Asante Traditional Buildings". یونیسکو. http://whc.unesco.org/en/list/35. Retrieved on 28 May 2010. ↑ "Banc d'Arguin National Park". یونیسکو. http://whc.unesco.org/en/list/506. Retrieved on 28 May 2010. ↑ "Bassari Country: Bassari, Fula and Bedik Cultural Landscapes". یونیسکو. http://whc.unesco.org/en/list/1407. Retrieved on 4 August 2013. ↑ "Bwindi Impenetrable National Park". یونیسکو. http://whc.unesco.org/en/list/682. Retrieved on 28 May 2010. ↑ "Cape Floral Region Protected Areas". یونیسکو. http://whc.unesco.org/en/list/1007. Retrieved on 28 May 2010. ↑ "Chongoni Rock-Art Area". یونیسکو. http://whc.unesco.org/en/list/476. Retrieved on 28 May 2010. ↑ "Cidade Velha, Historic Centre of Ribeira Grande". یونیسکو. http://whc.unesco.org/en/list/1310. Retrieved on 28 May 2010. ↑ "Cliff of Bandiagara (Land of the Dogons)". یونیسکو. http://whc.unesco.org/en/list/516. Retrieved on 28 May 2010. ↑ "Comoé National Park". یونیسکو. http://whc.unesco.org/en/list/227. Retrieved on 28 May 2010. ↑ "Comoé National Park – Threats to the Site (2003)". یونیسکو. http://whc.unesco.org/en/list/227/threats/. Retrieved on 30 August 2010. ↑ "Dja Faunal Reserve". یونیسکو. http://whc.unesco.org/en/list/407. Retrieved on 28 May 2010. ↑ "Djémila". یونیسکو. http://whc.unesco.org/en/list/191. Retrieved on 28 May 2010. ↑ "Djoudj National Bird Sanctuary". یونیسکو. http://whc.unesco.org/en/list/25. Retrieved on 28 May 2010. ↑ "Dougga / Thugga". یونیسکو. http://whc.unesco.org/en/list/794. Retrieved on 28 May 2010. ↑ "Ecosystem and Relict Cultural Landscape of Lopé-Okanda". یونیسکو. http://whc.unesco.org/en/list/1147. Retrieved on 28 May 2010. ↑ "Fasil Ghebbi, Gondar Region". یونیسکو. http://whc.unesco.org/en/list/19. Retrieved on 28 May 2010. ↑ "Fort Jesus, Mombasa". یونیسکو. http://whc.unesco.org/en/list/1295. Retrieved on 11 July 2011. ↑ "Forts and Castles, Volta, Greater Accra, Central and Western Regions". یونیسکو. http://whc.unesco.org/en/list/34. Retrieved on 28 May 2010. ↑ "Fossil Hominid Sites of Sterkfontein, Swartkrans, Kromdraai, and Environs". یونیسکو. http://whc.unesco.org/en/list/915. Retrieved on 28 May 2010. ↑ "Garajonay National Park". یونیسکو. http://whc.unesco.org/en/list/380. Retrieved on 28 May 2010. ↑ "Garamba National Park". یونیسکو. http://whc.unesco.org/en/list/136. Retrieved on 28 May 2010. ↑ "Decision – 08COM X.26-27 – Inscriptions on the List of World Heritage in Danger". یونیسکو. http://whc.unesco.org/en/decisions/1229. Retrieved on 10 September 2011. ↑ "Decision – 16COM X.E – Removed from the World Heritage List in Danger: Garamba National Park (Zaire)". یونیسکو. http://whc.unesco.org/en/decisions/1249. Retrieved on 10 September 2011. ↑ "Gebel Barkal and the Sites of the Napatan Region". یونیسکو. http://whc.unesco.org/en/list/1073. Retrieved on 28 May 2010. ↑ "Gough and Inaccessible Islands". یونیسکو. http://whc.unesco.org/en/list/740. Retrieved on 28 May 2010. ↑ "Great Zimbabwe National Monument". یونیسکو. http://whc.unesco.org/en/list/364. Retrieved on 28 May 2010. ↑ "Harar Jugol, the Fortified Historic Town". یونیسکو. http://whc.unesco.org/en/list/1189. Retrieved on 28 May 2010. ↑ "Historic Cairo". یونیسکو. http://whc.unesco.org/en/list/89. Retrieved on 28 May 2010. ↑ "Historic Centre of Agadez". یونیسکو. http://whc.unesco.org/en/list/1268. Retrieved on 4 August 2013. ↑ "Historic City of Meknes". یونیسکو. http://whc.unesco.org/en/list/793. Retrieved on 28 May 2010. ↑ "Historic Town of Grand-Bassam". یونیسکو. http://whc.unesco.org/en/list/1322. Retrieved on 19 September 2012. ↑ "Ichkeul National Park". یونیسکو. http://whc.unesco.org/en/list/8. Retrieved on 28 May 2010. ↑ "iSimangaliso Wetland Park". یونیسکو. http://whc.unesco.org/en/list/914. Retrieved on 28 May 2010. ↑ "Island of Gorée". یونیسکو. http://whc.unesco.org/en/list/26. Retrieved on 28 May 2010. ↑ "Island of Mozambique". یونیسکو. http://whc.unesco.org/en/list/599. Retrieved on 28 May 2010. ↑ "Island of Saint-Louis". یونیسکو. http://whc.unesco.org/en/list/956. Retrieved on 28 May 2010. ↑ "Kahuzi-Biega National Park". یونیسکو. http://whc.unesco.org/en/list/137. Retrieved on 28 May 2010. ↑ "Kahuzi-Biega National Park – Threats to the Site (1997)". یونیسکو. http://whc.unesco.org/en/list/137/indicators/. Retrieved on 10 September 2011. ↑ "Kairouan". یونیسکو. http://whc.unesco.org/en/list/499. Retrieved on 28 May 2010. ↑ "Kasbah of Algiers". یونیسکو. http://whc.unesco.org/en/list/565. Retrieved on 28 May 2010. ↑ "Kenya Lake System in the Great Rift Valley and Australia's Ningaloo Coast inscribed on UNESCO's World Heritage List". یونیسکو. http://whc.unesco.org/en/news/765. Retrieved on 28 June 2011. ↑ "Kenya Lake System in the Great Rift Valley". یونیسکو. http://whc.unesco.org/en/list/1060. Retrieved on 28 June 2011. ↑ "Khami Ruins National Monument". یونیسکو. http://whc.unesco.org/en/list/365. Retrieved on 28 May 2010. ↑ "Kilimanjaro National Park". یونیسکو. http://whc.unesco.org/en/list/403. Retrieved on 28 May 2010. ↑ "Kondoa Rock-Art Sites". یونیسکو. http://whc.unesco.org/en/list/1183. Retrieved on 28 May 2010. ↑ "Konso Cultural Landscape". یونیسکو. http://whc.unesco.org/en/list/1333. Retrieved on 17 August 2011. ↑ "Koutammakou, the Land of the Batammariba". یونیسکو. http://whc.unesco.org/en/list/1140. Retrieved on 28 May 2010. ↑ "Ksar of Ait-Ben-Haddou". یونیسکو. http://whc.unesco.org/en/list/444. Retrieved on 28 May 2010. ↑ "Kunta Kinteh Island and Related Sites". یونیسکو. http://whc.unesco.org/en/list/761. Retrieved on 6 November 2015. ↑ "Lake Malawi National Park". یونیسکو. http://whc.unesco.org/en/list/289. Retrieved on 28 May 2010. ↑ "Lakes of Ounianga". یونیسکو. http://whc.unesco.org/en/list/1400. Retrieved on 11 July 2013. ↑ "Lake Turkana National Parks". یونیسکو. http://whc.unesco.org/en/list/801. Retrieved on 28 May 2010. ↑ "Lamu Old Town". یونیسکو. http://whc.unesco.org/en/list/1055. Retrieved on 28 May 2010. ↑ "Laurisilva of Madeira". یونیسکو. http://whc.unesco.org/en/list/934. Retrieved on 28 May 2010. ↑ "Le Morne Cultural Landscape". یونیسکو. http://whc.unesco.org/en/list/1259. Retrieved on 28 May 2010. ↑ "Lower Valley of the Awash". یونیسکو. http://whc.unesco.org/en/list/10. Retrieved on 28 May 2010. ↑ "Lower Valley of the Omo". یونیسکو. http://whc.unesco.org/en/list/17. Retrieved on 28 May 2010. ↑ "M'Zab Valley". یونیسکو. http://whc.unesco.org/en/list/188. Retrieved on 28 May 2010. ↑ "Maloti-Drakensberg Park". یونیسکو. http://whc.unesco.org/en/list/985. Retrieved on 4 Aug 2013. ↑ "Mana Pools National Park, Sapi and Chewore Safari Areas". یونیسکو. http://whc.unesco.org/en/list/302. Retrieved on 28 May 2010. ↑ "Manovo-Gounda St Floris National Park". یونیسکو. http://whc.unesco.org/en/list/475. Retrieved on 28 May 2010. ↑ "Mapungubwe Cultural Landscape". یونیسکو. http://whc.unesco.org/en/list/1099. Retrieved on 28 May 2010. ↑ "Matobo Hills". یونیسکو. http://whc.unesco.org/en/list/306. Retrieved on 28 May 2010. ↑ "Medina of Essaouira (formerly Mogador)". یونیسکو. http://whc.unesco.org/en/list/753. Retrieved on 28 May 2010. ↑ "Medina of Fez". یونیسکو. http://whc.unesco.org/en/list/170. Retrieved on 28 May 2010. ↑ "Medina of Marrakesh". یونیسکو. http://whc.unesco.org/en/list/331. Retrieved on 28 May 2010. ↑ "Medina of Sousse". یونیسکو. http://whc.unesco.org/en/list/498. Retrieved on 28 May 2010. ↑ "Medina of Tétouan (formerly known as Titawin)". یونیسکو. http://whc.unesco.org/en/list/837. Retrieved on 28 May 2010. ↑ "Medina of Tunis". یونیسکو. http://whc.unesco.org/en/list/36. Retrieved on 28 May 2010. ↑ "Memphis and its Necropolis – the Pyramid Fields from Giza to Dahshur". یونیسکو. http://whc.unesco.org/en/list/86. Retrieved on 28 May 2010. ↑ "Mosi-oa-Tunya / Victoria Falls". یونیسکو. http://whc.unesco.org/en/list/509. Retrieved on 28 May 2010. ↑ "Mount Kenya National Park/Natural Forest". یونیسکو. http://whc.unesco.org/en/list/800. Retrieved on 28 May 2010. ↑ "Mount Nimba Strict Nature Reserve". یونیسکو. http://whc.unesco.org/en/list/155. Retrieved on 28 May 2010. ↑ "Mount Nimba Strict Nature Reserve – Threats to the Site (1992)". یونیسکو. http://whc.unesco.org/en/list/155/indicators/. Retrieved on 11 September 2011. ↑ "Decision – 35COM 7A.3 – Mount Nimba Strict Nature Reserve (Côte d'Ivoire/Guinea) (N 155 bis)". یونیسکو. http://whc.unesco.org/en/decisions/4337. Retrieved on 11 September 2011. ↑ "Namib Sand Sea". یونیسکو. http://whc.unesco.org/en/list/1430. Retrieved on 4 August 2013. ↑ "Ngorongoro Conservation Area". یونیسکو. http://whc.unesco.org/en/list/39. Retrieved on 28 May 2010. ↑ "Niokolo-Koba National Park". یونیسکو. http://whc.unesco.org/en/list/153. Retrieved on 28 May 2010. ↑ "Decision – 31COM 7B.1 – State of conservation of World Heritage Properties – Niokolo-Koba National Park". یونیسکو. http://whc.unesco.org/en/decisions/1381. Retrieved on 11 September 2011. ↑ "Nubian Monuments from Abu Simbel to Philae". یونیسکو. http://whc.unesco.org/en/list/88. Retrieved on 28 May 2010. ↑ "Okapi Wildlife Reserve". یونیسکو. http://whc.unesco.org/en/list/718. Retrieved on 28 May 2010. ↑ "Okapi Wildlife Reserve – Threats to the Site (1997)". یونیسکو. http://whc.unesco.org/en/list/718/indicators/. Retrieved on 11 September 2011. ↑ "Okavango Delta". یونیسکو. http://whc.unesco.org/en/list/1432. Retrieved on 6 Dec 2014. ↑ "Old Towns of Djenné". یونیسکو. http://whc.unesco.org/en/list/116. Retrieved on 28 May 2010. ↑ "Old Town of Ghadamès". یونیسکو. http://whc.unesco.org/en/list/362. Retrieved on 28 May 2010. ↑ "Osun-Osogbo Sacred Grove". یونیسکو. http://whc.unesco.org/en/list/1118. Retrieved on 28 May 2010. ↑ "Pitons, cirques and remparts of Reunion Island". یونیسکو. http://whc.unesco.org/en/list/1317. Retrieved on 10 July 2011. ↑ "Portuguese City of Mazagan (El Jadida)". یونیسکو. http://whc.unesco.org/en/list/1058. Retrieved on 28 May 2010. ↑ "Punic Town of Kerkuane and its Necropolis". یونیسکو. http://whc.unesco.org/en/list/332. Retrieved on 28 May 2010. ↑ "Rabat, modern capital and historic city: a shared heritage". یونیسکو. http://whc.unesco.org/en/list/1401. Retrieved on 30 June 2012. ↑ "Rainforests of the Atsinanana". یونیسکو. http://whc.unesco.org/en/list/1257. Retrieved on 28 May 2010. ↑ "Decision – 34COM 7B.2 – Rainforests of Atsinanana (Madagascar) (N 1257)". یونیسکو. http://whc.unesco.org/en/decisions/4110. Retrieved on 11 September 2011. ↑ "Richtersveld Cultural and Botanical Landscape". یونیسکو. http://whc.unesco.org/en/list/1265. Retrieved on 28 May 2010. ↑ "Robben Island". UNESCO. http://whc.unesco.org/en/list/916. Retrieved on 28 May 2010. ↑ "Rock-Art Sites of Tadrart Acacus". UNESCO. http://whc.unesco.org/en/list/287. Retrieved on 28 May 2010. ↑ "Rock-Hewn Churches, Lalibela". UNESCO. http://whc.unesco.org/en/list/18. Retrieved on 28 May 2010. ↑ "Royal Hill of Ambohimanga". UNESCO. http://whc.unesco.org/en/list/950. Retrieved on 28 May 2010. ↑ "Royal Palaces of Abomey". UNESCO. http://whc.unesco.org/en/list/323. Retrieved on 28 May 2010. ↑ "Ruins of Kilwa Kisiwani and Ruins of Songo Mnara". UNESCO. http://whc.unesco.org/en/list/144. Retrieved on 28 May 2010. ↑ "Decision – 28COM 15B.41 – Ruins of Kilwa Kisiwani and Ruins of Songo Mnara (United Republic of Tanzania)". UNESCO. http://whc.unesco.org/en/decisions/213. Retrieved on 11 September 2011. ↑ United Nations Educational, Scientific and Cultural Organization (17 June 2014), Tanzania’s Ruins of Kilwa Kisiwani and Ruins of Songo Mnara removed from UNESCO List of World Heritage in Danger, archived from the original on 5 September 2015, retrieved 5 November 2015 . ↑ "Ruins of Loropéni". UNESCO. http://whc.unesco.org/en/list/1225. Retrieved on 11 November 2015. ↑ "Ruwenzori Mountains National Park". UNESCO. http://whc.unesco.org/en/list/684. Retrieved on 28 May 2010. ↑ "Sacred Mijikenda Kaya Forests". UNESCO. http://whc.unesco.org/en/list/1231. Retrieved on 28 May 2010. ↑ "Saint Catherine Area". UNESCO. http://whc.unesco.org/en/list/954. Retrieved on 28 May 2010. ↑ "Salonga National Park". UNESCO. http://whc.unesco.org/en/list/280. Retrieved on 28 May 2010. ↑ "Decision – 23COM X.B.21 – SOC: Salonga National Park (Democratic Republic of the Congo (DRC))". UNESCO. http://whc.unesco.org/en/decisions/2666. Retrieved on 11 ستمبر 2011. ↑ "Saloum Delta". UNESCO. http://whc.unesco.org/en/list/1359. Retrieved on 17 August 2011. ↑ "San Cristóbal de la Laguna". UNESCO. http://whc.unesco.org/en/list/929. Retrieved on 28 May 2010. ↑ "Sangha Trinational". UNESCO. http://whc.unesco.org/en/list/1380. Retrieved on 11 November 2015. ↑ "Selous Game Reserve". UNESCO. http://whc.unesco.org/en/list/199. Retrieved on 28 May 2010. ↑ United Nations Educational, Scientific and Cultural Organization (18 June 2014), Poaching puts Tanzania’s Selous Game Reserve on List of World Heritage in Danger, archived from the original on 22 October 2015, retrieved 5 November 2015 . ↑ "Serengeti National Park". UNESCO. http://whc.unesco.org/en/list/156. Retrieved on 28 May 2010. ↑ "Simien National Park". UNESCO. http://whc.unesco.org/en/list/9. Retrieved on 1 August 2010. ↑ "Simien National Park – Threats to the Site (1996)". UNESCO. http://whc.unesco.org/en/list/9/indicators/. Retrieved on 11 September 2011. ↑ "Stone Circles of Senegambia". UNESCO. http://whc.unesco.org/en/list/1226. Retrieved on 28 May 2010. ↑ "Stone Town of Zanzibar". UNESCO. http://whc.unesco.org/en/list/173. Retrieved on 28 May 2010. ↑ "Sukur Cultural Landscape". UNESCO. http://whc.unesco.org/en/list/938. Retrieved on 28 May 2010. ↑ "Taï National Park". UNESCO. http://whc.unesco.org/en/list/195. Retrieved on 28 May 2010. ↑ "Tassili n'Ajjer". UNESCO. http://whc.unesco.org/en/list/179. Retrieved on 28 May 2010. ↑ "Teide National Park". UNESCO. http://whc.unesco.org/en/list/1258. Retrieved on 28 May 2010. ↑ "Timbuktu". UNESCO. http://whc.unesco.org/en/list/119. Retrieved on 28 May 2010. ↑ "Ansar Dine fighters destroy Timbuktu shrines". Al Jazeera. 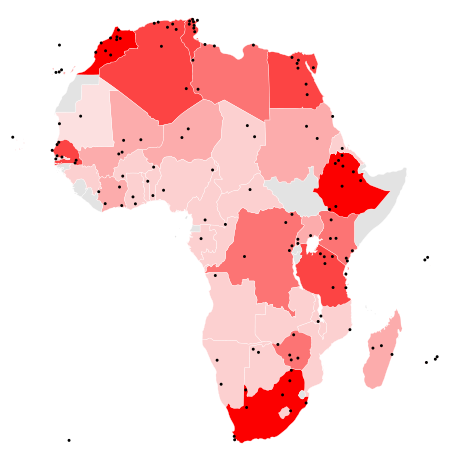 30 June 2012. http://www.aljazeera.com/news/africa/2012/06/2012630101748795606.html. Retrieved on 30 جون 2012. ↑ "Timgad". UNESCO. http://whc.unesco.org/en/list/194. Retrieved on 28 May 2010. ↑ "Tipasa". UNESCO. http://whc.unesco.org/en/list/193. Retrieved on 11 January 2011. ↑ "Tiya". UNESCO. http://whc.unesco.org/en/list/12. Retrieved on 28 May 2010. ↑ "Tomb of Askia". UNESCO. http://whc.unesco.org/en/list/1139. Retrieved on 28 May 2010. ↑ "Heritage sites in northern Mali placed on List of World Heritage in Danger". UNESCO. 28 June 2012. http://whc.unesco.org/en/news/893. Retrieved on 30 جون 2012. ↑ "Tombs of Buganda Kings at Kasubi". UNESCO. http://whc.unesco.org/en/list/1022. Retrieved on 28 May 2010. ↑ "Uganda tombs to be reconstructed". Afrol News. 13 April 2010. http://www.afrol.com/articles/35917. Retrieved on 11 ستمبر 2011. ↑ "Decision – 34COM 7B.53 – Tombs of Buganda Kings at Kasubi (Uganda) (C 1022)". UNESCO. http://whc.unesco.org/en/decisions/4161. Retrieved on 11 September 2011. ↑ "Tsingy de Bemaraha Strict Nature Reserve". UNESCO. http://whc.unesco.org/en/list/494. Retrieved on 28 May 2010. ↑ "Tsodilo". UNESCO. http://whc.unesco.org/en/list/1021. Retrieved on 28 May 2010. ↑ "Twyfelfontein or /Ui-//aes". UNESCO. http://whc.unesco.org/en/list/1255. Retrieved on 28 May 2010. ↑ "Vallée de Mai Nature Reserve". UNESCO. http://whc.unesco.org/en/list/261. Retrieved on 28 May 2010. ↑ "Virunga National Park". UNESCO. http://whc.unesco.org/en/list/63. Retrieved on 28 May 2010. ↑ "Virunga National Park – Threats to the Site (1994)". UNESCO. http://whc.unesco.org/en/list/63/indicators/. Retrieved on 11 September 2011. ↑ "Vredefort Dome". UNESCO. http://whc.unesco.org/en/list/1162. Retrieved on 28 May 2010. ↑ "W National Park of Niger". UNESCO. http://whc.unesco.org/en/list/749. Retrieved on 28 May 2010. ↑ "Wadi Al-Hitan (Whale Valley)". UNESCO. http://whc.unesco.org/en/list/1186. Retrieved on 28 May 2010.